On August 21, 2013, Sean Boushie signed a sworn affidavit before a notary, and he swore that Bill Windsor had no legal business in Montana. The false sworn affidavit was used to get William M. Windsor arrested and jailed for 134 days. CRIMINAL CHARGE AGAINST SEAN BOUSHIE: On August 21, 2013, Sean Boushie signed a sworn affidavit before a notary public as part of his Petition for Temporary Order of Protection. In the sworn affidavit (page 3), he stated that Bill Windsor had no legal business in Montana. He lied about this so that he could claim that Bill Windsor's purpose in coming to Missoula Montana was to "stalk, threaten, harass, and intimidate me in person." Bill Windsor's legal business and Constitutionally-protected right was to film a segment for the Lawless America Movie as well as the pilot for a proposed weekly television series. There are at least a dozen articles that were published abpout this during the year prior to the Missoula filming. 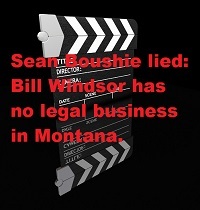 Sean Boushie was also well aware that Bill Windsor was in Missoula to take his deposition and his wife's deposition in a civil matter. They failed to appear for their depositions. Sean Boushie was also fully aware that Bill Windsor was in Montana to report him to law enforcement and to attempt to obtain an order of protection as Georgia told him that he would have to file for protection in Montana. This is all documented in a published article.